Here’s something odd, well at least I find it odd. I’ve never had a Shasta soda that I can remember. It’s Shasta! How have I lived 31 years and never had one. 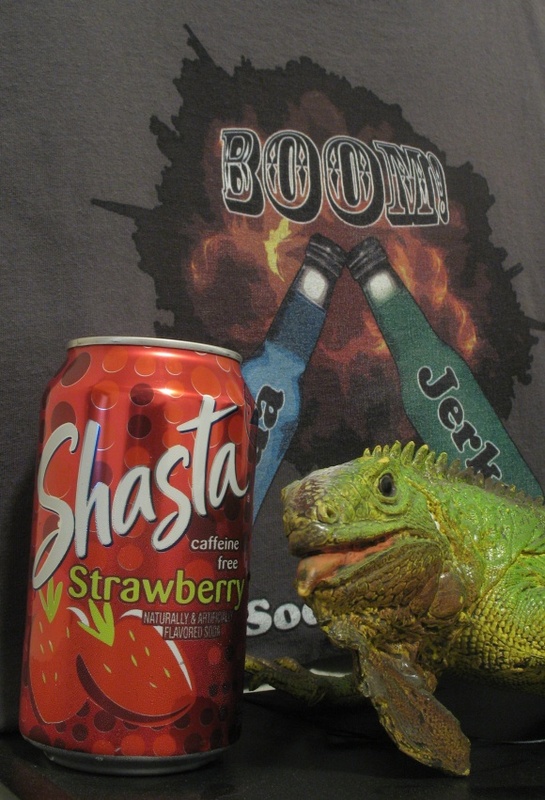 The mascot of one of our local universities is named Shasta, yet trying the drink has eluded me. I’m not exactly sure how a mascot’s name and me trying a soda tie in together, but that doesn’t matter when it’s something as silly as this. A nice lady I work with, whom I will name Good Morning, put me on a mission to find Strawberry Shasta. Upon searching for it I found that the only places near me that sold Shasta were Brookshire Bros. grocery stores. Now I’m not sure how it is where you live, but around here Brookshire Bros. are located in more rural areas so I rarely see one. Well, Good Morning was driving past one by chance and made the U-turn to check it out. Long story somewhat shorter, she brought me a Shasta Strawberry to review. Glancing at the ingredients I quickly see that Shasta Strawberry is chock full of chemical goodness. I wasn’t expecting anything amazing here, so my thoughts have not been swayed. This can art is keeping me in a positive mood. It feels so fun and retro while keeping the can fresh and eye-catching. Hopefully the flavor is on the fun side. It smells of strawberry soda. Ok, a little more detail is necessary. It’s not quite as sugary smelling as I thought it would be, but the chemical mixture inside keeps it from smelling like fresh strawberries or any nonsense like that. Wow, color me somewhat slightly impressed. Shasta Strawberry, even with 36 grams of sugar in it, doesn’t taste a sugar sandwich made with sugar, marshmallows, sugar, sugar, and some strawberry syrup. No, in fact this tastes merely like sugar, carbonated water, and strawberry syrup which oddly enough is a step in the right direction for strawberry sodas. Enough blabbering, this tastes like the carbonated version of those little strawberry candies your grandmother bought back in 1985. If you want to buy over five pounds of these candies or just want to know what I’m talking about click this fabulous link. Anywho, these strawberry candies (and Strawberry Shasta) have the talent of chemically mimicking both the tart and sweet aspects of our friend the strawberry. It is this feature that allows me to gently nudge Shasta Strawberry past its numerous counterparts.